They relish in punching Nazis. They protest in all black. And they've vowed to physically confront racists and extremists across the country. But who exactly are the protesters that violently clashed with white nationalists in Charlottesville, Virginia? During a combative press conference Tuesday, President Donald Trump dubbed the anti-racist protest groups the "alt-left" and blamed "both sides" for the violent clashes that resulted in the death of Heather Heyer, a 32-year-old peaceful demonstrator, and injured more than a dozen others. Trump's remarks have received widespread condemnation on the left and the right, and his critics have accused the president of appeasing white nationalists and bigots. 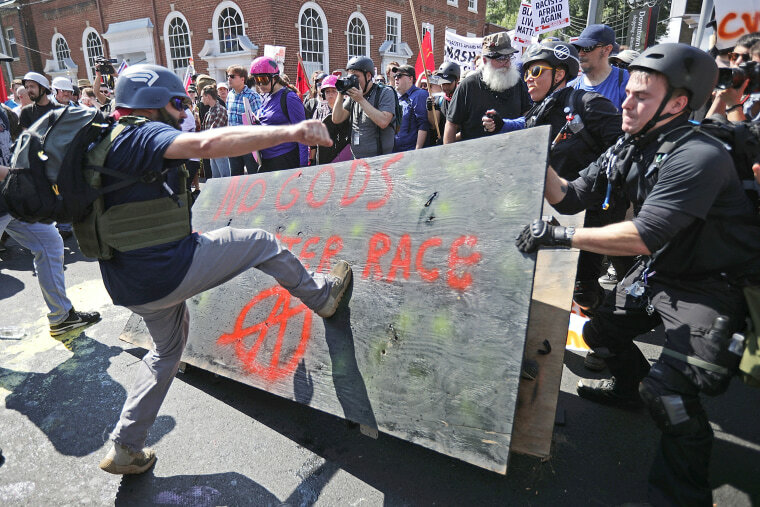 But they've also brought renewed attention to the so-called anti-fascist protesters that have often violently clashed with white nationalists in the aftermath of President Trump's election. Antifa is short for "anti-fascist." It is a loosely organized coalition of protesters, left-wing activists, and self-described anarchists who vow to physically confront "fascists" — meaning anyone who espouses bigoted or totalitarian views. Dana R. Fisher, a sociologist who has studied protest movements in the United States for decades, said she's come to view Antifa protesters as a militant response to the rise in visibility of white nationalist organizations since Trump's election. "Violence begets violence," she said. "One of these groups is coming out with this violent message of hate, and the other has responded with a violent, reactive message." "These men and women are basically deciding that there's a violent alt-right that's threatening people, and that they should arm and defend the left," said Fisher. Although various anti-fascist organizations have existed for decades, since President Trump's election both their membership and visibility have grown. It's difficult to estimate the size of the group's membership, but today there are branches of the organization in most major cities across the country. The protesters are typically young people who are angered by the rise in hate crimes and white nationalism in the wake of President Trump's election. The protesters are also notoriously media-shy, which Fisher said is common for anti-government groups. NBC News reached out to several Antifa organizations for this story, but they did not wish to be interviewed. Anti-government and anti-fascist protesters have disrupted protest movements in Europe for decades. Today, they are most frequently seen clashing with riot police during summits of major world leaders, as in last month's "Welcome to Hell" protest against G-20 leaders in Berlin. But President Trump's election seems to have injected new vigor into U.S.-based anti-fascist organizations. On Inauguration Day, black clad protesters rioted, damaged property and destroyed a limo while peaceful anti-Trump protesters marched nearby. Since then, Antifa protesters have clashed with white nationalists in Berkeley, Calif., Chicago and now, Charlottesville. Charlottesville fact check: Were both sides to blame for violence? In the wake of President Trump's election, Antifa organizations across the country issued rallying cries on social media to rise up and fight back against the wave of hate crimes and white nationalism that's spiked across the nation. Protesters began appearing at pro-Trump demonstrations across the country, often under the guise of protecting peaceful counter demonstrators. But frequently the rallies would descend into chaos. Fisher said typically anti-government and anti-fascist protesters do not hold firm political views, but she said Antifa protesters have adopted the language and positions of the left. She also draws a sharp contrast between the rhetoric used by Antifa and the far-right. "At least on the left, they don't seem to be spouting hate," she said. "Whereas on the right, the one thing they can all agree on is spouting hateful and racist messages attacking inclusion and diversity." Antifa protesters often use a tactic called "black bloc," a style of protesting popularized by anti-government demonstrators in Europe. They typically wear all black clothing and hide their faces to avoid being identified by police, to avoid being pepper sprayed and also to cast an intimidating presence. In both the U.S. and Europe, the "black bloc" tactics generally include rioting, vandalism and protesting without a permit. But in the aftermath of Trump's election, Antifa protesters have often violently clashed with the president's supporters and white nationalist groups at demonstrations across the country. In April, pro-Trump protests in Berkeley descended into an all out brawl. Similar clashes shut down a speech by right-wing commentator Milo Yiannopoulos at the University of California, Davis, and an Ann Coulter lecture again at Berkeley. Fisher says it's possible that the Antifa movement could attract the kind of radical protesters that are prone to violent outbursts, but she believes their presence has a deeper message about the current state of political discourse in the U.S.
"This is a response to aggressive alt-right messaging," she said. "These guys and women are basically deciding that there’s a violent alt-right that's threatening people and that they be the militia that will support and defend the left."